We had our third Library Services for Children Journal meeting this past Sunday. We read two articles that explored play and the learning environment. Here’s a quick recap of the articles and discussion points. This post, except for the final thoughts at the end, was written by our group leader Jennifer Streckmann. Want to get involved with the LSC Journal Club? See if you have a local group or start one of your own! This was an in-depth look at child play psychology as related to the physical space of the classroom, which can be extrapolated out to the library setting. stacking, water play, and outdoor play. Constructive play describes children combining pieces or entities, such as with blocks. The purpose of this type of play is to make something and/or work out a problem. children. See the example provided below. enact real-life types of play activities. usually called “sports.” Children begin the games with rules stage at about age 6. Interesting study that involved looking at the number of toys available, and how that affects how children interact with the toys. An abundance of toys present reduced quality of toddlers’ play. Fewer toys at once may help toddlers to focus better and play more creatively. This can done in many settings to support development and promote healthy play. This study was quite limited in its scope as the sample size was small and it captured a picture of mostly middle class white female toddlers. The group participated in a ‘blue-sky’ activity where we paired off and re-designed a library space. Each pair was given a copy of the image below that depicted a children’s department. 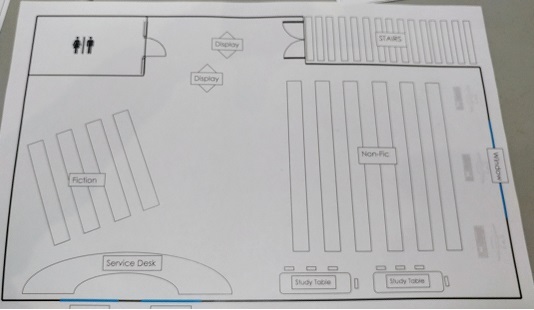 Then they were given a blank layout to design the space from scratch. After working in pairs we all shared our designs. Including interesting conversation starters that invite patrons to speak with a staff member. This could be anything from a terrarium with butterflies to an engaging display which encourages the children to ask staff a question. We often want to separate different age groups from each other, however a good point was brought up that this sometimes makes it much harder for caregivers to keep track of their whole family. Thus sightlines are very important. Weeding was done by all groups, in an interest of using space for programming. Focus on the Collection: Are displays placed where community members will see them? Is the collection well maintained and weeded regularly? Is the collection organized in a way that makes sense to kids and families? Is signage clear and attractive (not too much, not too little)? Focus on Play: Are there opportunities for play in the library? Are there play opportunities for little kids and bigger kids? Do families feel comfortable playing in our spaces? Focus on Relationship Building: Are there elements in the space that encourage kids and families to talk to staff? Are there opportunities for kids and families to contribute their ideas or thoughts to the space? Are staff regularly in the space to interact with the community? We also talked about how important it is to observe your space. Some of the organizations in Vancouver like Science World do a great job of testing out their spaces and regularly observing them before making tweaks and changes. This of course requires time and energy but the resulting changes can be powerful. That’s a wrap, folks! Did you read the articles this month? I’d love to hear your thoughts in the comments! I love the idea of the LSC Journal Club and I’m looking to start one in Kansas City, MO. Wondering if you have any advice on how to see if people locally are interested? I plan on contacting children’s librarians within the system I work for, however I wanted to try and reach people outside of my system that are in the area. Any advice would be welcomed. Hi Sarah, that is so exciting! Contacting the children’s librarians within your system is a great first step. Do you have a state library association with a youth division? They might perhaps have a list-serve you could email to find others who are interested. You could also try posting in the Storytime Undergound Facebook Group to see if anyone is nearby and wants to join you. And though it has the word “library” in the title, you are more than welcome to open it up to anyone working with small children, especially if you are in a smaller area or can’t find enough library people to join. I will put a call out on my Jbrary social media accounts to see if I can find anyone near Kansas City. Is it okay if I give them your email to follow-up with you? I can also list you on the “Find a Group” page on the LSC Journal Club website if you’re okay with that too. Hopefully we can drum up some interest! Unfortunately I’m not on Facebook, which is another hurdle when trying to find people who might be interested. I’ll look into a possible MLA youth services list services I could take advantage of, good idea. I also love the idea of asking people working with small children, at preschools or daycares. I would greatly appreciate you sharing my email on the website and asking around on social media. Thank you, I appreciate everything you do and will do! !